How to use Confidential Mode on Gmail? Home > Latest > Privacy & Security > How to use Confidential Mode on Gmail? If you are a businessman or some individuals who send really confidential files over Gmail but you don’t want the receiver to misuse it, then this new feature of Gmail will really help you a lot. This year’s Google I/O has revealed some of the new features in many Google apps and also Google Duplex, Google rolled out some serious and game-changing features in Gmail. One of those features could make some serious noise for businesses and any privacy-centric user, That feature is Confidential Mode. What is Confidential Mode on Gmail? 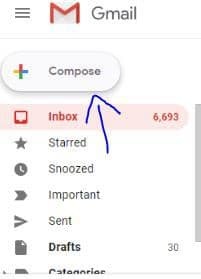 In the Confidential mode in Gmail, the email message that you send expires after a period of time which you will this, by default, the time period is 1 week but you can change it. A confidential message can have an extra layer of security in which when the recipient receives the mail they have to enter the passcode that is sent to them via SMS. How to use Gmail Confidential Mode? To use Gmail Confidential Mode, first of all, you need to activate new Gmail. Not sure if you are using Gmail Confidential Mode, click on the gear icon, the first option you see i.e. try new Gmail, click on that. It will redirect you to the new Gmail and if you are already using new Gmail, it will say go back to classic Gmail, you don’t need to do that!! After clicking on Compose you will see a little time icon near all icons. 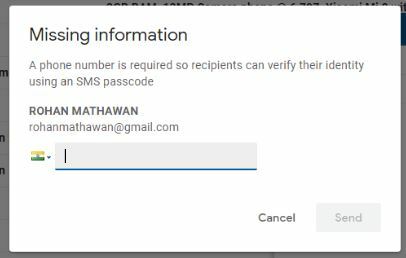 On Confidential Mode Pop Up screen, you can select expiration date (mail will automatically delete after a certain period of time) and you can also set if you want them to enter the passcode or not which will be sent to the receiver via SMS. If u select require a passcode when you will send mail a screen will pop up saying missing information, you are required to put in the number of the recipient to verify the identity of the recipient. And that’s all in Gmail’s new Confidential Mode!! Will Gmail Confidential be useful to you? comment down below! Chrome’s Incognito mode activities are still visible to others & it is not safe for you.